Yeah. They're not gonna mention AJ's parents. Because that would require they actually put some thought into how to present the issue of death to the audience; and that is something that they (rightfully) do not want to touch if they can at all help it. True. They're a bit affraid of dealing with death subject. For teen/adult bronies, this would be a great storyline. But for small children not so much. But again, Disney and Don Bluth killed a lot of characters onscreen and offscreen. The thing is I don't really get why they would be afraid of touching on it, because as me and others have pointed out before many kids cartoons have had dead parents, its not like it would be anything new. Edit: Also since they do the reunion every 7-8 years (Granny Smith says they do it about every 100 Moons) this means if Applejack was a newborn in the flash back Applejack is between 16 and 24 years old right now, according to someone of 4chan who did the math. (since she was already talking in the flash back I'm guessing she is much closer to 24) This also means that Applebloom (and likely none of the CMC) can be older then 8 years old. When ever I think about dead parents in cartoons I think back to Rugrats which was pretty straight up with the "She's dead" thing in regards to Chuckie's mother. I've never understood the mentality of "We can't have their parents be dead; it's a kids' show." I mean, yeah, death is a heavy subject, but it's also something children do come in contact with. It's not like there's a death-free-zone surrounding children. A lot of children have dead family members, and it's something that people have to deal with regardless of age. I'm not saying make a really gloomy dark episode about death, but I don't think it would scar anyone to have a character with canonically dead family members, so long as it was handled properly. It's not like knowing other kids with dead family members scars children (at least, so far as I know, which is admittedly not far). Heck, they could address it without having to say the word "dead" or "died", if they wanted to. I dunno, it just bothers me when "kid friendly and light" becomes "we can't suggest anything bad happens". I also noticed a conspicuous lack of the word "die" in Wonderbolts Academy. When Rainbow Dash referred to what could have happened to her friends, she dodged that word. Or rather, the writers did. Yeesh, didn't mean to be the impetus of such an involved discussion. Ok that was a pretty good episode and it was nice to see Babs and Braeburn again. Applejack was rather enjoyable this episode and I'm glad she finally got her own episode, it was really needed.Her going overboard with the 7 legged race was funny as heck. Her song was really catchy and I can see some great remixes coming out of it. We learned that Babs has two other CMCs in Manehatten which was a good follow up to that whole thing from her last appearance. Over all this episode was a 7/10 for me. Oh by the way CloudChaser, BonBon and Carrot Top are members of the Apple Family apparently, I mean they were only in the background but its not like CloudChaser or BonBon are really incidental background ponies anymore (You can really argue for Carrot Top), if they ever were, especially CloudChaser. Edit: A lot of people have pointed out the two shooting stars from the beginning of the episode (were AJ is looking out of the door to her house when Granny Smith is talking) and at the end of the episode when they pull away from the barn; pretty much most people agree that it was a way to represent her Parents with out really saying anything. So it basically confirms they are in fact dead. I'm really not one for the whole "everything means something" (though that isn't to say its not sometimes true, because obviously sometimes it is) style of looking at books and movies and tv ect. ; and really if it had only shown up once I could see it being just looking into it to much but twice, once near the start and then at the end, that's kind of clear symbolism IMO. What do you guys think? 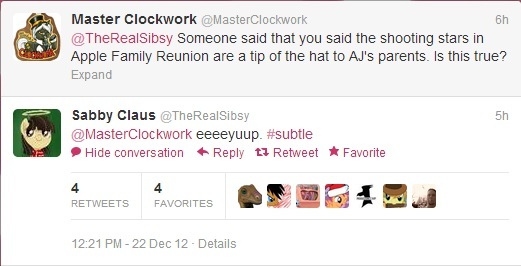 It seems that finally we got a definitive hint that Aj's parents are dead. Also my sole complaint about the episode was the lack of lines from Braeburn. Last edited by angelusbr on Sat Dec 22, 2012 6:47 pm, edited 1 time in total. I liked the song. listened to it three times. Now Rainbow Dash is the only one without a song all her own. I also liked Spike as a lighter. I find it odd that they say "gesundhoof" when someone sneezes. Spike being used as a lighter was cool, as was the cameos from everyone else especially Pinkie Pies. Rainbow Dash accidentally shocking AJ was funny as well. Spike also doesn't have a song just his. edit: I liked how they played the dead parents. Also, are the ponies who pulled the train now part of the apple family (maybe they married a member or they were a member already. I'm glad to see that they didn't forget about Babs. I honestly thought she would never come up again, much less in the same season. Someone already made a post about this. That comic was really good. I wonder if there is actually going to be more Trixie in the future though. I liked it! I'm pretty sure it's basically a guarantee that Applejack's parents are dead. -The fact that everyone showed up... except no parents. Did anyone notice that when Apple Bloom fell over from being dizzy, she made a faint Wilhelm scream? Yes but they also used a Wilhelm scream in the new Trixie episode, so it wasn't that funny for me a second time around. 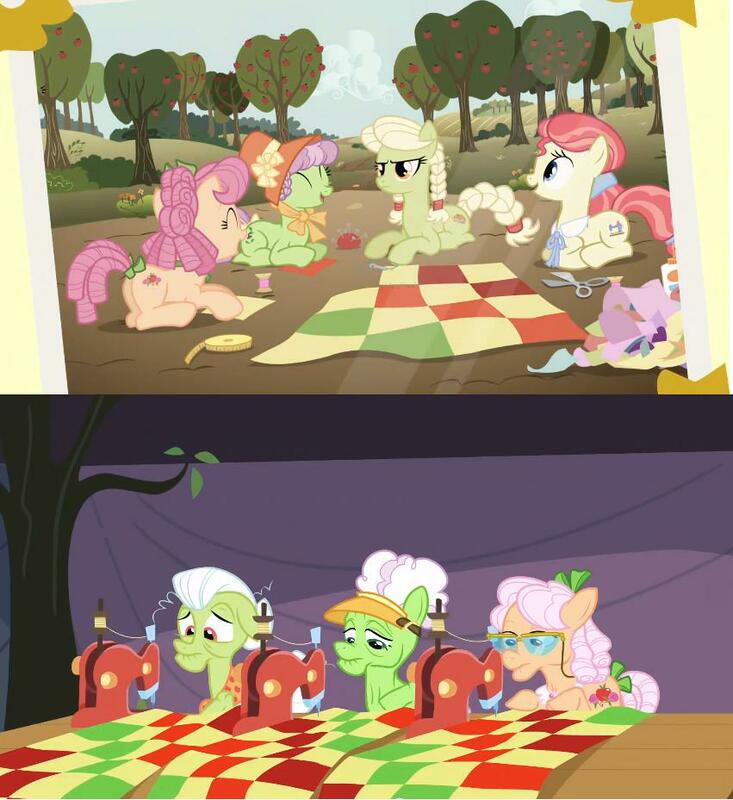 And the two unknown ponies are a reference to the old painting called American Gothic. And I also want more Gilda. EDIT: Here is something interesting that someone pointed out on Reddit in the comments. The fact that the missing one is missing and has likely passed, they are faced with what her cutie mark represented. All the feels for those gals. Just now saw the new episode. Not bad, not bad at all. It wasn't an "epic" episode like Magic Duel or Wonderbolt Academy, but it didn't really need to be. It was sweet, funny, and heartwarming, exactly what's called for for an Applejack episode. The song was catchy and pleasant. Not the best song or anything, but catchy and perfectly fitting for Applejack. And I really liked how they fit in AJ's parents without, you know, actually addressing them. Very tasteful. Also, those Apple family members that arrived in the airship are now my favorite Apple family members. That was awesome. I just realized why I seem to like the new song more than most people do. I like Bluegrass music and the new song has a very Bluegrass feel. Another edit: She and my brother are getting into pony. On a relevant topic, what has your favorite song of season 3 been so far, y'all? The Babs seed song. A lot of people didn't like it because of reused animation and stuff like that, but that was just part of the song and actually makes it my favorite. Take away the videos and just focus on the music, it's still my favorite too. So far the only song I liked on season 3 so far was the raise the barn. I guess this newest one would be my favorite. It's a tough question, for me. I mean, none of this season's songs have been bad, but in my opinion none of them so far have been as good as the best songs of season 2. Yeah, season 2 had the best songs. But to answer my own question, probably Babs Seed's song. This Day Aria has to be my favorite from season 2. But it was still too short in my opinion. As for the best songs in the series, I have to go with The Smile Song and At the Gala. Mostly because these songs actually feel like full songs to me. Most of the others just seem too short. Even the Flim Flam Brothers song felt too short? Gosh, that song was roughly 33 seconds longer than At the Gala. Last edited by IceKitsune on Mon Dec 24, 2012 2:19 am, edited 2 times in total. apparently it's been pointed out that "Raise This Barn" sounds like "Racist Barn"
Oh, right. I never did comment on Saturday's episode, huh? My initial thoughts were thus: it was an average episode. The song was average, the time I spent giggling at the humor was average, the conclusion was average. Nothing about it really struck me as anything special. It had a few nice moments, and getting to see Babs and Braeburn (even though he didn't talk) again was neat. Now that I've had a few days to sit on it and have rewatched a few parts over again, I find that I've changed my mind. It was a much better episode than I gave it credit for; and I'm still not quite sure why I was apparently being so harsh on it as it was playing. The allusion to AB, AJ, and Mac's parents (which I actually missed while watching the first time) was great, the song, while a little repetitive for my tastes, is actually really well-done, the animation throughout was really great (the Octavia reskin playing her violin was fantastic), I was impressed by the diversity (in both color and design) of the Apples from outside Ponyville (and the ones who arrived via zeppelin? so. cool. ), and the interactions between the characters (AB and Babs, especially so) were really entertaining. Plus, the moral at the end was actually incredibly touching. I've always thought those tended to be among the cheesiest parts of episodes, but on my second (and third) rewatches of that final scene, I was practically on the verge of tears because of how close AJ's letter hit to home. There is so much truth behind that message, and the delivery was just excellent. Seriously. I don't know what was going through my head while I was watching the first time through that made me miss out on so much of what the episode had to offer. As for my favorite song of S3? I dunno. None of them have hit me especially hard. Raise This Barn is just not my type of music, Babs Seed is the same way (though I'll admit it's pretty dang catchy), Crystal Fair was kinda meh, and The Failure Song was just too short. If I had to choose, I'd probably go for The Failure Song. The vocals are very nice, and the animation that went along with it was brilliant on all levels, and I feel like it represented the song I was kind of expecting Twilight to have right in the beginning of the series. If it'd been longer, I feel like it could've been to Twilight what Smile was for Pinkie. An anthem of sorts, that embodies the character, showcasing their biggest hopes and aspirations and what really makes them tick. So, yeah. Even though it didn't quite live up to expectations, The Failure Song had the most potential to be one of the better songs in the series. Oh my gosh the animation for that violin player was freaking awesome. Alright, I refer to to the songs that I liked. The Flim Flam song was a good length, just not my kind of song. The songs that I like more than average all seemed too short. I would have to give it to Smile Smile Smile from season 2. For Season 3 it would probably be Bad Seed, despite questionable lyrics. What do you mean questionable lyrics? I liked them. I didn't think they were great. The Lyrics to Babs Seed while not overall great, are pretty catchy IMO. Though the chase section from when the song is playing makes the song for me. Its kind of like Thriller in that way, the song itself is just kind of ok but the video that comes with it just makes the song so much better.